For those of you who have read JoliHouse since it was my mum’s blog (thank you so much for sticking around! ), this may come as old news, but I thought I ought to explain a bit of background behind the knitwear that I show here every now and then. I’m aware that new followers might wonder what on earth I’m talking about when I mention my designs and projects, so bear with me! Since I was tiny I’ve had a creative streak, always had some form of artsy crafty ‘thing’ at my fingertips. A ‘mosaic dolphin’ kit springs to mind, but I was obsessed with watercolours, cross stitch, and all sorts really. Around age 8 my mum and Nannie taught me the basics of knitting, and from there I practiced making a whole host of bizarre items. Once I’d progressed through lumpy garter stitch scarves, to stuffed animals, to lace wedding dresses for dolls, I began making socks and accessories for myself and friends. There wasn’t (and still aren’t) a great deal of garment patterns suitable for a 5’6 eleven year old, so I leapt in at the deep end and wrote my own pattern for a seamless, fitted, yoked jumper. From then on I was bitten by the designing bug and continued with my own creations, and published my first free downloadable pattern to Ravelry 2 months after starting secondary school. I remember the crown of Aira turning out so pretty as a happy accident, which definitely gave me encouragement to carry on! In 2010 my mum and I were at a little crafty gathering in the Lake District, when Juliet Bernard – editor of The Knitter magazine at the time – popped over to say she really loved the knitted laceweight cardigan I was wearing. (With denim shorts and cowboy boots btw. I wish I had photos of that outfit!). Excited, we started chatting and she asked to feature my design in her magazine. Of course I excitedly agreed, and around my 13th birthday my pattern was published as a supplement with The Knitter. This is turning into a brief history, so I’ll skip the next few years and just say that I’m very grateful for the opportunities I had to design for myself, and publications like US Vogue Knitting and other UK brands! Almost everything I’ve made over the years can be seen on ravelry here, so feel free to have a look around/laugh at 10 year old Lily’s peculiar poses. Anyway, back to the now! As you can see from the first pictures in this post, I’m still very much a crafty one now. Currently on the needles – passing between my mum and I – are two summery designs of mine: a ribbed, poloneck cropped top and a laceweight camisole. Both in shades of pink, which is unusual for me. This year I’m determined not to fall into my usual trap of only starting summer projects in June, to only finish once the sun’s gone into hibernation. Often when I’ve mentioned ‘designing’ and ‘selling patterns’ to my friends/peers they’ve been confused as to what it is I actually sell, so I thought I might clarify! I’ve written about my design process a few months ago here, and from that point I write up the pattern/instructions to be downloaded from Ravelry. The main confusion when I’ve told people is that I don’t actually sell physical ‘things’, just PDFs of instructions, diagrams and pictures. (Hope that doesn’t sound patronising, I just know people have been confused before!). Whilst I’m more than happy to post pictures on the internet, until not long ago I was reluctant to let anybody at school know about this hobby of mine. Knitting has a certain ‘old granny’ stigma attached; it seemed pointless advertising the fact that I spent some of my free time knitting to people who weren’t going to be interested in my patterns anyway. Even last year, after I’d gained confidence about wearing my knits, I was slightly dubious about taking my GCSE project into school to work on. You know what some teenagers can be like! However my sitting knitting away at school was mostly met with curiosity; a few odd looks but no negative comments, luckily. Something that’s always puzzled me is the assumption that hand crafted = frumpy and old-fashioned. Most teenagers would happily wear a Topshop jumper or cardi , but would flinch at the thought of wearing the handknit equivalent. A turnaround of sorts has definitely occured over the last few years, and to a certain extent, hand crafts have become ‘cool’ – ish. I’m thanking programmes like the Great British Sewing Bee for this! Love love love Tilly and the Buttons. Still, I had the feeling that people would be surpised to see that I was knitting a bodycon skirt with see-through panels, that I’d like to think is more Rihanna than Miss Marple. Personally I adore the ‘granny chic’ look, and styled in certain ways I think outdated knits can look fabulous. However, there’s still a way to go in raising the profile of ‘make your own’, particularly amongst teenagers. Lets hope the rise of crafty young bloggers and the like will do so! Hmm…I wasn’t a knitter as a teenager, so I’m not sure what the response would have been. But I can tell you that most would be interested, impressed, and respectful of your abilities — maybe not the boys, but you can’t win them all! Truthfully, you should be proud you have such a creative mind. Most of us don’t. So let your (knit) freak flag fly! Yeah the boys weren’t particularly impressed! Thank you so much Marta, I shall contine to wear my knits proud! Yay go us! People asked me what I was ‘sewing’ too; the circular needles confused them I think. I wish my teachers would let me knit in class! Are you in the UK? wow you are really talented. I also love crafts, I am really into crocheting at the moment. Its just such a nice thing to do, super relaxing and makes awesome presents. Hi Lily! I’ve been following you for a while, but it’s only today that I finally put myself through writing a comment instead of just reading anonymously! So yes, I’ve been following this blog from the time it was still your mom’s, and I remember I’ve always thought how young yet talented you were! I think the Altounyan cowl you’ve designed is being in my to-do list ever since it has been added to Ravelry, some day I’ll eventually kick myself out and make one! 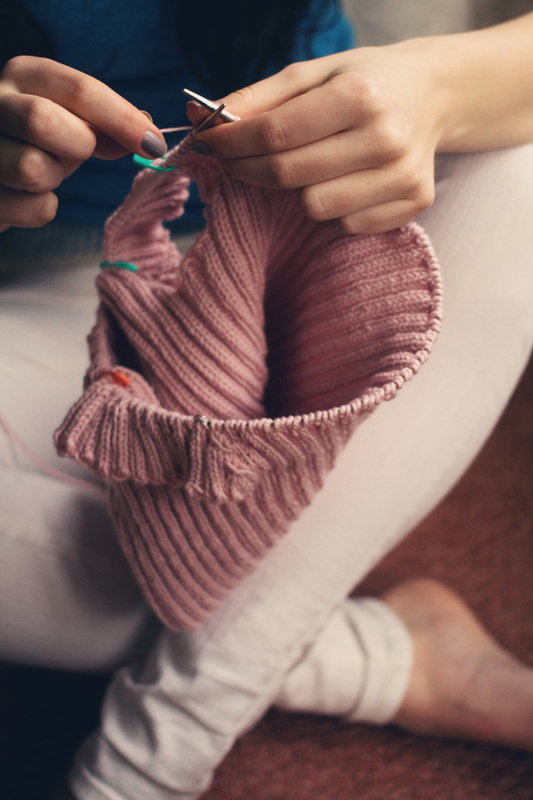 As a knitter myself, I also feel shy about “coming out of the closet” when it comes to crafting, because it has this ambivalent popular image of something totally trendy but also totally granny-like. And I hate being glanced at when crafting, either by total strangers or by friends (which is even more irritating, because it goes from aggressive “teach me! !”, to “nothing to brag about, I myself can knit scarves too” scorn). But still, I never hesitate to knit when I have to take the train, otherwise journeys might become so boring! Also, I wanted to say how great it is to see the beautiful young woman you’re becoming! 🙂 I tend to like most of your posts, but I have to confess my favourites are the ones when you’re featuring crafts! Keep the good work up, and sorry for my clumsy American English! Thanks so much Clothilde! It really is nice getting to know my readers, and finding out who’s stuck around reading my blog as it’s evolved. The Altounyan pattern is really quick and easy to make, I’m sure you’d enjoy knitting it:) Friends have asked me to knit them copies of my designs too, without realising that a 4-ply jumper takes months to make. It’s so lovely to know you like my blog! I try my best to include crafts as much as possible, without alienating any ‘anti-crafty’ possible readers haha. I’d love to be able to knit on journeys, but I suffer from travel sickness so it’s rarely worth the risk. Your English isn’t clumsy at all, don’t be daft! Your knitting skills are amazing! I wish I could knit, but am a bit apprehensive because everybody that I ask to teach me gives me a “look” when I say I’m left-handed. But I’ve been sewing for a year now (I just turned 17)and I can’t imagine life without it! It just gives me so much freedom that you just don’t get with ready-to-wear. Thanks Lauren! I know a few left handed knitters; they’ve sort of invented their own way of knitting but they do a great job of it. I’d love to get into sewing more and I’d probably make all my own clothes by hand if I could. Have you been watching the Great British Sewing Bee? I managed to catch the first episode last week and it was brilliant, but this week I’ve been revising like crazy for mocks and I didn’t get a chance to watch it last night. I really want to be in the next series but you have to be 18 🙁 Have you been watching it? Knitting is great,but your designing is really what stands out. There are just not that many people who are really so creative and willing to try things that may not work out. I’ve followed your mum’s blog for a while and I like how knitting is a something you could do together, but, yeah, as an eleven year old you did have to update and carve your own path. Maybe it helped you to start so young, more daring. I’ve knit more since ravelry and blogs came on the scene. As for the frumpiness factor, there is definitely that association. I kind of like it. In an ironic way. In truth, there is no age to knitting. Thank you Max! You always leave the most encouraging comments, makes me smile 😀 I’ve had many an angry moment when I’ve had to rip a project forthe 50th time, but often it does encourage me to stretch my creativity! I definitely became much more involved with knitting when I joined ravelry, and now I try to pick up the needles whilst catching up on my favourite blogs. I sort of like it in an odd way too – it’s nice to have an unusual hobby! Ah I’ve brought you out of hiding! 😀 It is pretty ridiculous that such stereotypes still exist like this, when in most cases individuality and quirkiness is seen as a good thing. Well done with the tech-editing! I find teaching myself things the best way too. We’re on the way of it improving, but not to the point where I’d ask to knit in class yet! That’s so cool that you can knit full clothing pieces!! My nana taught me how to knit when I was younger too 🙂 I didn’t do anything really advanced haha but I can see why people would like to knit! – It’s a great hobby – you can do it when you’re just watching tv or even bring it with you when you go travelling! And I mean, you can make so many different things, it’s great! There’s so muc more flexibility with making clothes for yourself! I barely look at my knitting when I’m doing it so it’s a great hobby for multitasking. I’d definitely recommend picking up the needles again!